If there is one thing that we should know after three drafts and four top four picks is to not rush to snap judgements with whatever it is that Chris Grant and the Cavaliers decide to do on draft night. Tristan Thompson was nothing but an undersized power forward who was historically bad offensively early on in his career. Dion Waiters never started a single game for Syracuse, did not put up great numbers in college and didn't even work out for the Cavs. To make matters worse, he was overweight when he was drafted 4th overall by Cleveland. Both of these guys have proven to be just as good (if not better) than the players that were considered the conventional picks who were taken after them. Chris Grant marches to the beat of his own drummer. It can be frustrating for fans who are convinced that he is leaving a surefire talent on the board, but he has a fairly good track record when it comes to drafting. 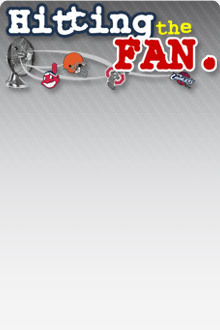 The issue is that die-hard fans spend 82 nights a year watching their team. When the losses pile up, it is comforting to take solace in the fact that good will eventually come of it in the way of a high draft pick. When your team is out of playoff contention by January, it is tempting to read prospect scouting websites and watching videos that highlight their strenghts and weaknesses. The fan starts to envision how great a specific player would look on their team and before the season even ends, they form an emotional attachment to their favorite player. Draft day comes and goes and that player was left on the board. This is something that we have now seen first-hand as Cleveland fans for three straight drafts. 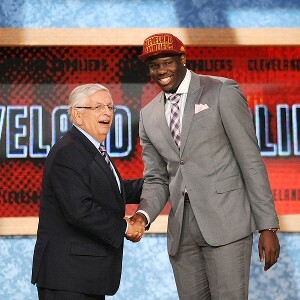 The Cavaliers shocked the world tonight when they selected Anthony Bennett first overall. On the day of the draft, well-respected journalist Adrian Wojnarowski tweeted "Becoming harder to map a scenario where UNLV's Anthony Bennett doesn't slide on board. He could leave Portland with choice at No. 10." This is a guy who is about plugged in as anybody can be on the inner-workings of the NBA, and he believed that Anthony Bennett could fall all the way to the 10th pick. It doesn't matter to Chris Grant. He liked Bennett, so he took him. At the end of the day, can he be blamed? I don't know how much I like the pick. It leaves a bit of a logjam at the power forward position. On the one hand, Bennett and Thompson can complement each other quite well. Bennett is offensively polished and may be able to step out to the NBA three point range. Thompson is not, but he makes up for it where Bennett lacks: defensively. The issue is that it is not a given that they will be able to share the floor. I have always maintained that Thompson has more of an offensive skill set of a center, but he lacks to size to play at that position full time. At the end of the day, it seems likely that Tristan Thompson will be used as trade bait to hopefully help facilitate a trade for a veteran. It is unlikely that they will be able to share the floor for extended periods of time. Anthony Bennett averaged 15.8 PPG, 8.0 RPG, 0.9 APG, 0.7 steals and 1.2 blocks in 27 minutes per game for UNLV. Bennett can score in a variety of ways. He is efficient under the basket and can step out to the three point line. He's not great with his back to the basket, but he finds a way to score from the block. "Cleveland pushing to acquire Dallas' 13th overall pick, with a focus on drafting Russia's Sergey Karasev, league sources tell Y!. Cleveland believes it has to get ahead of Milwaukee at 15, but it's possible Cavs need to get even higher to assure Karasev will be there." At 6'5", Karasev has good size for the small forward position. He is a good catch and shoot wing man who will help spread the floor for the Cavs. With Kyrie Irving and Dion Waiters in the back court, this selection makes a lot of sense for Cleveland. Karasev struggled with consistency and defensively, but his ability to shoot, attack the rim and his high basketball IQ should hopefully make up for it. The Cavs also selected Allen Crabbe with the 31st pick. He was traded to the Portland Trailblazers for 2 future second round picks. They capped off their evening by taking the shooting guard Carrick Felix. The 22 year old SG/SF likes to play off the ball and is supposed to be very good in catch-and-shoot situations. I do not know what kind of grade to give the Cavs. If I had it my way, they would have selected Nerlens Noel. Having said that, he fell all the way to the sixth spot and New Orleans traded him along with a 2014 first round pick for Jrue Holiday. I was not excited about Anthony Bennett going into the draft, but the Cavs should have probably earned benefit of the doubt after their scouting has proven to be of high quality.